Harley-Davidson Motor Company and the Full Throttle Saloon’s Pappy Hoel Campground have partnered to name the Pappy Hoel Campground as the official campground for Harley Owners Group (H.O.G.) during the 77th annual motorcycle rally in Sturgis, SD. All H.O.G. members attending the rally will be invited to the official H.O.G. welcome party at the Pappy Hoel Campground Pool, on Tuesday, August 8, featuring live entertainment, drink specials, prize raffles and more. Additional details to be announced on pappyhoelcampground.com soon. An invitation to join the 17th annual Pappy Hoel Charity Motorcycle Ride from the Full Throttle Saloon to the Stone House, on Wednesday, August 8. Proceeds will be split between a local charity (in the past, the funds have provided a scholarship to a local school and been donated to the Sturgis Fire Department) and designated H.O.G. charities. 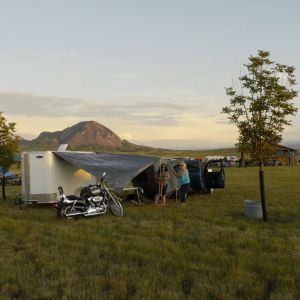 The Pappy Hoel Campground sits on 600 acres beneath beautiful Bear Butte, in Sturgis, SD. Together with the Full Throttle Saloon, it features an Olympic-sized swimming pool, the largest stage in South Dakota, and hundreds of cabins, RV and tent camping sites. Announced entertainment and attractions for 2017 so far include Travis Tritt (8/7), Bret Michaels (8/9), The Dead Daisies (8/9), Jackyl (8/10), Billy Lane and the Sons of Speed, a firing range, and much more to come. H.O.G. members wishing to renew their membership to take advantage of these benefits can do so at hog.com any time or at the Harley-Davidson/H.O.G. event display on 3rd and Lazelle Streets in downtown Sturgis during the rally Aug. 5-12. To make reservations or for general campground and entertainment updates, please visit www.pappyhoelcampground.com.